Last month we introduced Operations Assistant, Brody Brown, who discussed her desert island must-haves and hatred of mushrooms. Taking to the spotlight this month is accounts star Ann McArdle who has been at the company for four years. Although Ann is a grandmother to two little boys with another on the way, her Eagle Couriers’ family is just as important to her as her expanding one at home. Read on to find out more about her dream dinner party, her energising superpower and love of the Victorian era. What do you do at Eagle Couriers? 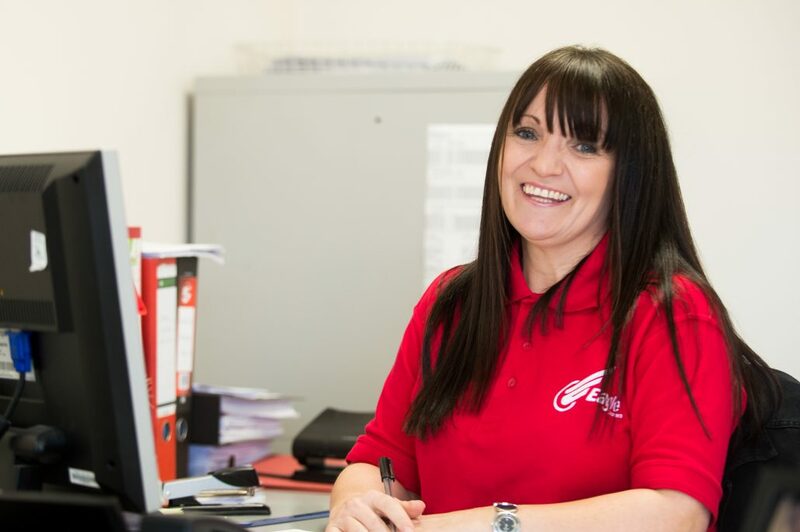 I work in the accounts department at Eagle Couriers surrounded by a fantastic team of people. How long have you been working at Eagle Couriers? I’ve worked here for four years. Do you have any strange delivery stories/ encounters from your time at Eagle couriers? Unfortunately the cliché is true, nothing too exciting happens in accounts. I’ve heard some funny stories though with drivers picking up anything and everything from pigeons to dentures. What do you most enjoy about working at Eagle Courier? I enjoy the way everyone on the team works together. We have a really cohesive work force. What’s something unexpected about you? I don’t think it’s unexpected but most people do. I prefer Pepsi over Coca-Cola. I hate it in restaurants when they don’t have Pepsi and they ask if Coke is ok. Coke and Pepsi taste so different and Pepsi is the superior drink. I don’t have a lot of spare time. I have two grandchildren; Cian who is two and a half and Lewis is eight months old. I try and spend as much time with them as I can so that really takes up most of my spare time. I do play bingo though I could never take the boys there – that would cause too much havoc. What’s one food that you can’t stand? I cannot stand any type of fish. The smell and slimy look of it is repulsive. If you could live inside the world of any book/ TV / series or film which one would it be and why? I would love to be in Pretty Woman. I just love Richard Gere. If you could have dinner with any three people living or dead, who would it be and why? I would have dinner with my gran. I was so close to her when I was growing up and I miss her so much. I would also have dinner with my husband and Richard Gere. Though on reflection that could be a bit of an awkward situation – the two loves of my life meeting. If you were stranded on a desert Island and you could only bring three things with you what would they be and why? I would bring my family as I couldn’t live anywhere without them and I would bring Diet Pepsi and ice cream to sustain us on the island. I would have a surplus of energy. I’m always tired and, with another grandchild on the way, I am in desperate need of an energy boost. If you could travel to any point in time, where would you go? I would love to travel to the Victorian era and wear those huge fancy dresses and lace gloves. If you could teleport yourself anywhere in the world right now where would it be? I would teleport myself to Sydney, Australia. My son is just back from there and the beaches look beautiful. I could also use some sun on my skin and some time to relax before the baby comes.